SHUNYA means nothingness, emptiness. The mission we have for our chant events, is as a group, to go deep into our true selves into love, presence & joy. This is a new & unique group, bought together and facilitated by Vinod Prasanna. Following many reaharsals, this event will be "launched at the Carton Libray" on the special day of Holi (India's infamous Colour Festival). If you'd like to get into the spirit of Holi you are welcome to wear bright colourful clothing. 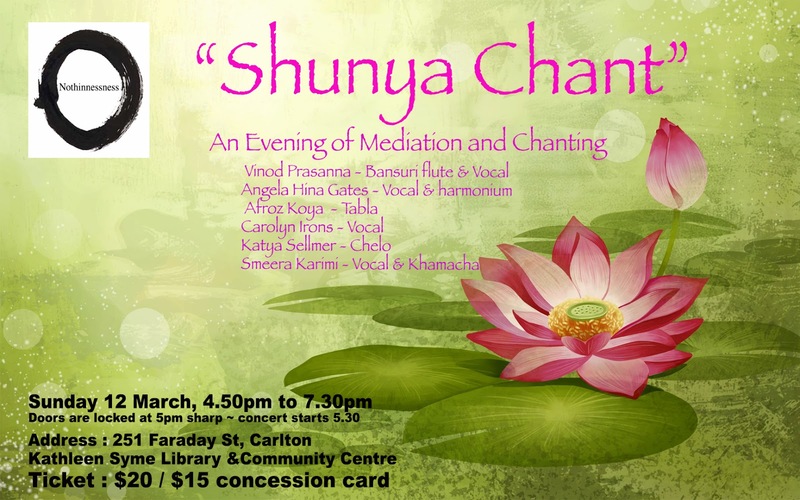 This chanting group comprises : Angela Hina Gates, Afroroz Koya, Sameera Karimi, Carolyn Irons & Vinod Prasanna. Please enjoy 'in presence' this devotationoal chant with us. Tickets : $20/$15 concession card holder.